Foam inserts added to Lean 5S Products range! 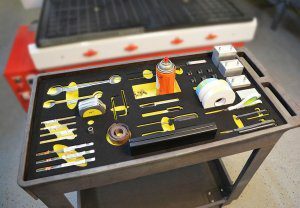 Following our continued success in creating stunning shadow boards, cleaning stations and production boards we now introduce a full foam insert shadow board service. Using the latest scanning and CNC processes we provide quality 5S and organizational solutions. 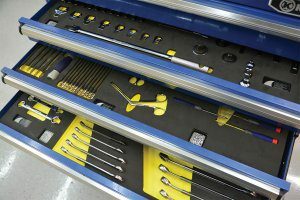 Tools and equipment can now be properly stored and arranged to maximize the operators time and energies. We can either provide a unique template for you to use to create your shadows or we can come in onsite and use the latest scanning equipment to create the design and layout of the tool shadows you require. Choose from custom size and colour foam and with logos and title text on each. Speak to one of our advisors today to see how we can support your organization.